Join us for a week of peace-related workshops, labyrinth walks, documentaries and featured artist Daryl Davis, an American R&B and blues musician, author, actor and bandleader who for the past 30 years, has spent time befriending members of the Ku Klux Klan. Come together on Valencia's Winter Park Campus on International Peace Day (September 21st) to create our annual Human Peace Sign! This year we will create a candlelit peace sign at night! 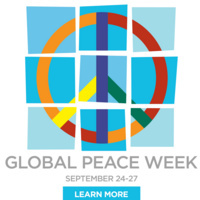 The United Nations sanctioned International Peace Day is September 21st of every year. The mission of Peace Day is to have at least one harmonious, non-violent, cease-fire day in the whole world. Visitwww.peaceoneday.org for background on how International Peace Day came into being and for more information on what you can do to help accomplish a global change.